← Rain, tears, and tea on the Gunflint. What I cooked this week. Inspiration or comedy, you pick. I started this cooking week with Cilantro Chicken. Will was so delighted he bloated himself on it. Then ate it’s leftovers the next afternoon. He continued to eat all the leftovers for the rest of the week. Last weeks mild failure of White Winter Pasta turned into just bean goo pasta. The leftovers were even dry bean goo. I added more olive oil and ate it for lunch anyway. Bluck, bigger fail. Quesadillas were up next. I started making these years ago when Will was craving Taco Bell. I think my vegetarian ones are way better. Fried finely chopped, mushroom, onion and bell pepper. Sometimes I stop there. This time I added black beans and corn. A whole bunch of minced cilantro tossed in towards the end. Mixed sour cream with worcestershire and sriracha sauces, chipolte powder, garlic powder, lime juice, whatever other red spicy powders I happen to have on hand. This time it was smoked paprika and cayenne. Fried flour tortilla, put on veggies, and shredded cheese (usually the mexican melting stuff). 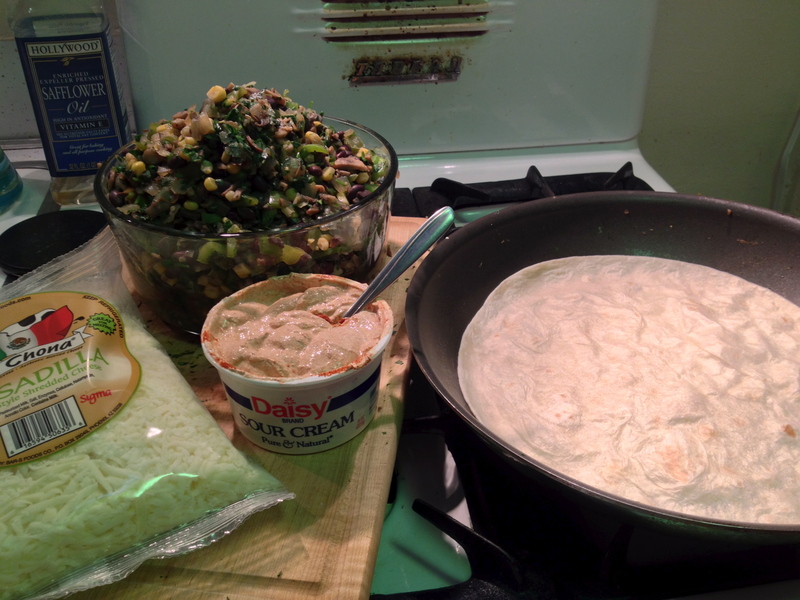 Spread sour cream sauce on other tortilla. Smoosh on and flip to fry other side. I slice it up with the pizza cutter and serve it with salsa. I forgot to buy salsa! We were salsa-less. I also turned out to be a miserable flipper. Each one I made throughout the week got sloppier and sloppier. Then I found out that Will has an entirely different method of assembling them. Due to my dad dropping off some fantastic curry and our beloved Tracy’s Saloon re-opening (mmmmm burgers, fries and beer!) that’s all I cooked this week. Tonight I will cook the salmon pasta I meant to make earlier. Next week I’m feeling it’s about time for some steak and potatoes. What did you eat this week? Have any plans for next week? 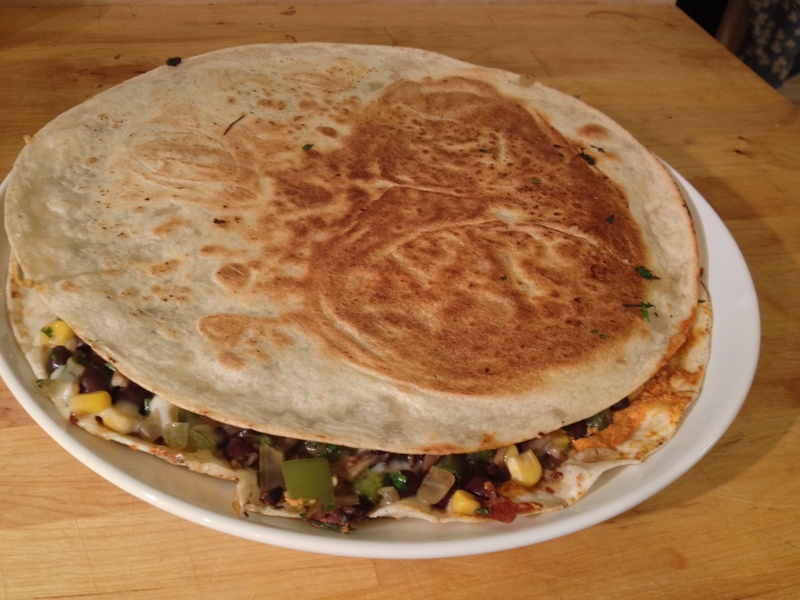 This entry was posted in Kym Cooked and tagged chicken, cilantro, cooking, food, quesadillas, vegetarian. Bookmark the permalink.